It's hard to believe that today is already the final day of the Winter Coffee Blog Hop, but it's true. There sure have been a lot of fabulous projects shared, and I've sure had fun linking up my coffee creations. It's always so much fun pulling out all my coffee sets to create fun cards and projects for this special event. This card was made using some Echo Park Season's Greeting patterned papers and border stickers, a kraft card base, a kraft tag cut from Paper Sweeties tag set called For You Sweet Cuts, and a Paper Sweeties coffee cup and steam from their Coffee, Yes Please Sweet Cuts. Some ribbon, a green button, a plastic candy cane, border stickers, a black pearl accent, and a rusty paper clip are the finishing touches. The sentiment (Sending Warm Hugs and Kisses) is from a Paper Sweeties set called Let It Snow. I recently sent this card to my sweet blog friend, Bunny. I'm sharing my card in the Winter Coffee Blog Hop. 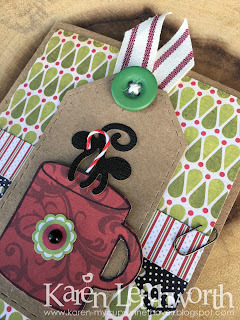 Winter Coffee-Loving Cardmakers' Blog Hop - Anything Coffee, Tea, or Cocoa related with a Winter theme. 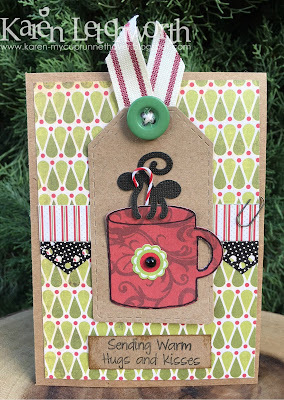 This card uses a Paper Sweeties coffee cup and sentiment. Love all the pretty greens! fun kraft tag. I like the look and colors. I like your little candy cane there with the steam. This paper is a little different than the other papers you used. Not very vintage like your usual. I like it. I like how the cup looks. I hope you have a blessed day today. Great mix of patterns! Love the flower on the cup!